Okay, so we’re nearing the end of the Chakra Segment. To back pedal a lil bit check out the where we’ve been, The Root, The Saccrum, The Solar Plexus & The Heart. This will give you a little background on the 4 of the 7 chakras or energy sources in the body. Today we’re at The Throat Chakra, so let’s get started. Vishuddha or The Throat Chakra: This space is located at the base of throat and is the space held for communication, creativity and growth through self expression. 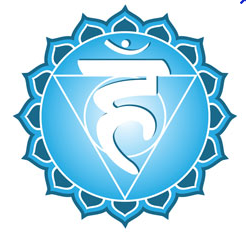 Physically The Throat chakra is associated with thyroid gland, upper lungs and respiratory system. Color: Vishuddha is represented by the color turquoise. Blue is the color of inspiration, devotion, infinity and religious goals. It produces calm and peace. Blue is also a cooling color and is said to aid with internal bleeding and nervous conditions. You’re All Good: When your heart chakra is balanced you can communicate easily, clearly and with authority. Your voice is in harmonious balance and speaks to your inner truth and creativity. You develop your artistic talents and have an influential effect on others. Unbalance: An unbalanced throat chakra is said to effect the thyroid and neck issues as well as a lack of dynamism and motivation. You may also have difficulty expressing yourself, have fear, doubt uncertainty or habitually lie. Get Stoned: All the blue stones; sapphire, lapis lazuli, blue topaz, aquamarine, turquoise, chrysocolla and sodalite – are used to heal or balance the throat chakra. So now it’s time to speak your truth, my friends. “The truth will set you free” and maybe thrown on something blue today just because! This entry was posted in FIERCE HEALTH, FIERCE SOUL, FIERCE- ISH and tagged #chakras, #speakyourtruth, #Truthsetsyoufree by GETFIERCE TRAINING. Bookmark the permalink.